This article talks about security breach that will affect verty many people in the USA. It can cause need to rethink the current sloppy security practices on many companies – the identifying data many companies use has now leaked out. The private data of 143 million Equifax “customers” is now available for download. Have no doubt: This means you will be hacked. This means your SIM card can be spoofed. This means someone will try to get into your email and online accounts. This means someone will try to open a credit card in your name. First, we cannot allow our most precious data to be accessible via the last four digits of our social security number. Further, we must also outlaw SMS two-factor authentication. 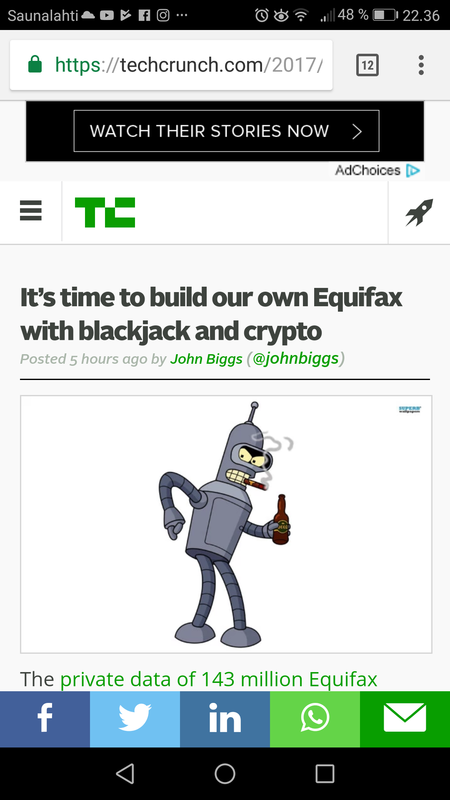 In fact, thanks to the data stolen from Equifax, that process can be easily broken. Mistakes happen. Ultimately we must hold these companies that keep leaking sensitive data accountable for their fails. In short, it’s time for those who are careless big data to die. USA might need to look outside the US for leadership in security. The “special committee” investigating for the company concluded that “none of the four executives had knowledge of the incident” and that none engaged in insider trading. “I’m grateful for the timely and thorough review,” non-executive chairman Mark Feidler said in the statement. Equifax on Thursday said that during the third quarter of 2017, it incurred $87.5 million in expenses related to the massive hack that was disclosed on September 7, 2017. The credit reporting agency provided a breakdown of expenses as follows: $55.5 million in product costs, $17.1 million professional fees—a good portion which likely was paid to FireEye’s Mandiant division, attorney’s, and any other firms hired as part of the incident investigation and response. Customer support costs was marked at $14.9 million. The company also said that it would be liable for additional costs stemming from the free credit file monitoring and identity theft protection that it is offering all U.S. consumers. Equifax, the credit reporting firm, is facing more than 240 class-action lawsuits from consumers — in addition to suits from shareholders and financial institutions — over the way it handled a massive data breach that affected 145.5 million Americans. The lawsuits were detailed in the company’s third-quarter earnings report Thursday, its first since revealing the breach in September. The incident prompted three top officials to leave the company, including former chief executive Richard Smith. To date, SEC Chairman Jay Clayton has not confirmed or denied that the SEC is investigating those executives for insider trading, according to the Associated Press. The credit bureau is also facing more than 60 government investigations from states, U.S. federal agencies and the British and Canadian governments, the earnings report revealed. Equifax estimates that the breach-related costs will total $87.5 million, including the cost of the free credit-monitoring services it provides to breach victims. Equifax reported $834.8 million in revenue in its third quarter, which is up 4 percent from the same time last year; analysts had expected this, as the bulk of the company’s money comes from selling services to other business, not consumers. Profits, however, were down 27 percent from the previous year at $96.3 million — in large part due to the breach. Following the Equifax breach and the hidden Uber breach, three U.S. senators have introduced the Data Security and Breach Notification Act. Its purpose is to ensure better protection of personal information, and to provide a nationwide standard breach notification requirement. It is effectively a re-introduction of the 2015 bill of the same name. There are three noteworthy aspects to this bill: 30 days to disclose following a breach; up to five years in prison for failure to do so; and the FTC with NIST to draw up recommendations on the technology or methodologies necessary to avoid such sanctions. Former Equifax exec Jun Ying has been charged with insider trading, according to the Securities and Exchange Commission. Ying is accused of knowing that Equifax had been hacked and selling company shares before the public was notified. The good news: the number of individuals affected by the network intrusion hasn’t increased from the 146.6 million Equifax previously announced, but extra types of records accessed by the hackers have turned up in Mandiant’s ongoing audit of the security breach. In February, in response to questions from US Senator Elizabeth Warren (D-MA), Equifax agreed that card expiry dates and tax IDs could have been among the siphoned data, but it hadn’t yet worked out how many people were affected. Equifax is financially stable and legally in the clear, but lawmakers aren’t backing down. In mid-May 2017, malicious actors exploited a known vulnerability in the Apache Struts development framework to gain access to Equifax systems. The company said the breach affected roughly 145 million customers – mostly in the U.S., but also in Canada and the United Kingdom. GAO report takes us inside Equifax from March 2017 onward, showing how a few slip-ups led to one of the biggest breaches in US history. Equifax was so unsure how much data had been stolen during its 2017 mega-hack that its IT staff spent weeks rerunning the hackers’ database queries on a test system to find out. During that attack, hackers broke into the credit check agency’s systems, getting sight of roughly 150 million people in America plus 15 million Brits, and others. We’ll call that the “holy crap” moment but there were other failings, including a lack of segmentation, a technique that could have isolated the databases from one another, or at least triggered an alarm when the intruders tried to move sideways through the network. Equifax did get lucky on one score: had the attackers erased some of the logs, reconstructing what they’d been up to during all those weeks of easy access may have been much harder. The information exposed due to lax security practices included names, dates of birth, addresses, phone numbers, driver’s license details, Social Security numbers, and credit card data. SEC said engineer figured out on his own that the website he was building was for the company’s security breach. A former Equifax engineer who coded parts of the company’s breach notification website for last year’s security incident was sentenced this week to eight months of home confinement and restitution of ill-gotten funds after using insider information about the Equifax breach to make over $75,000 from insider trading. The US Securities and Exchange Commission (SEC) charged Bonthu in June. He pleaded guilty a month later. According to court documents, Bonthu was one of the engineers who worked on coding the equifaxsecurity2017.com website where Equifax sent customers to see if they were affected by last year’s security breach during which a hacker stole the personal details of over 145 million users. The SEC said in an indictment that Bonthu realized on his own –based on test data and discussions on internal mailing lists– that the secretive Project Spart client was, in reality, his employer. The SEC said that Bonthu abused this information and used his wife’s brokerage account to buy 86 “put options” in Equifax stock worth $2,166.11. Bonthu’s stock options would come through if Equifax’s stock had gone below $130 per share by September 15. One single patch could’ve prevented one of the largest breaches in U.S. history. A House Oversight Committee report out Monday has concluded that Equifax’s security practices and policies were sub-par and its systems were old and out-of-date, and bothering with basic security measures — like patching vulnerable systems — could’ve prevented its massive data breach last year.